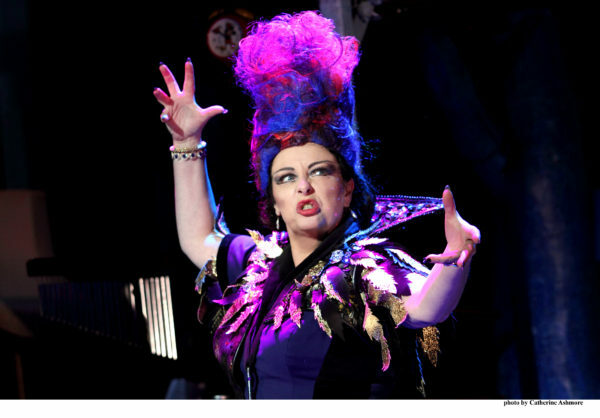 The Witches at the West Yorkshire Playhouse. Photo: Catherine Ashmore. ‘Tis the season for adaptation at the West Yorkshire Playhouse, it seems. In a bid to cater to younger audiences, running alongside their seasonal flagship production Strictly Ballroom: the Musical is a new version of Roald Dahl’s classic story The Witches by David Wood. As a refresher, Dahl’s story follows a young boy (Fox Jackson Keen) living in Norway, who comes under the care of his grandmother (Jenna Augen) after his parents die in a car crash. The boy is told he has to go and continue his education in England, but is warned by his gran about the deceptive, child-hating witches, many of whom live in that country. When the two go on a holiday to Bournemouth, the boy gets more than he bargained for when a group of the dastardly, bald sorceresses come after him and his friend Bruno (Jonny Weldon). Wood’s adaptation of Dahl’s madcap tale runs at just over an hour and fifteen minutes – perfect for little ones who get fidgety, and also perfect for adults looking for a bit of fun after a day at work. The ensemble of multi-roling performers inject high levels of energy into the performance, and it shines through in their characterisations. Keen, as the adventurous young lad, has great presence, feeding into the rest of the company’s performance as they regularly engage with the audience. There’s always a sense that – even in scenes that become quite chaotic – the cast have everything under control. Under Nikolai Foster’s smooth direction, their performances harmonise, both with each other and with the well-considered scenography. Isla Shaw’s set design – mainly consisting of a stairwell resembling a climbing frame and a hotel door – fits the scale of the Playhouse’s Courtyard theatre perfectly. The refreshing sparseness of the set places the performers and their characters at the forefront of the piece, a directorial choice that helps maintain engagement with the audience’s younger members. David Phillips’s lighting design is a bold and vibrant palette of block colours, with the occasional special effect thrown in for good measure. There’s also a refreshing blend of ambient sound and recorded music forming the body of Seb Frost’s sound design, accentuated by frequent performances of live music from the cast. My only modest criticism of Foster’s effort is that, at times, there seems to be a lack of true theatrical play. I get the feeling some scenes are perhaps too polished and over-rehearsed, pushing the cast into a corner of stagnation and rigidity. Sequences of action look far too planned at times, which can undermines their comic value and disengages the audience. The atmosphere comes from within the performers, and they need to trust that their well-realised performances will carry them through. That said, on the whole The Witches is an excellent, highly entertaining piece of family theatre. The Witches is on until 21st January 2017 at the West Yorkshire Playhouse. Click here for more details.